Kapost integrates with Eloqua 10 but there are different integration points that each version can support within Kapost. Below, we have explained our integration with Eloqua and what you can use within Eloqua as a Kapost user. Eloqua 10 – Kapost Integration: This is Eloqua's latest and newest version of Eloqua and based on that this is our most robust integration within Kapost. Asset Management of Landing Pages and Emails: Kapost allows you to manage Eloqua landing pages and emails, within Kapost through a read-only interface. Because Eloqua doesn't have a full editorial calendar or workflow management/collaboration tools, the integration allows you to create a new email or landing page in Kapost, then edit it in Eloqua so a version will exist in both places. You will still edit and customize the layout within Eloqua but you get the benefit of using and planning within Kapost's editorial calendar, seeing your initiatives exist alongside other content assets like social or blog posts and the collaboration workflow tool within Kapost that exists on every content type. Lead Conversion Metrics: Kapost also provides analytics around (new) leads generated on all the content you’ve created and pushed out through Kapost. This is data coming from Eloqua, but Kapost serves up the analytics in a unique format and ties to content you may never push through Eloqua (e.g. perhaps a tweet or blog post). You can learn about the leads and content analytics on the aggregate analytics view in Kapost and on individual pieces of content here. Pushing Files to Eloqua's Component Folder: Kapost also allows you to make Eloqua a destination where you can push files to. These files end up in your File Storage. Learn how to set this up here. Email Analytics: For any email synced to an email in Eloqua, we will pull in Eloqua Email Sent, Email Open, Email Bounce, Email Click Through, and Email Unsubscribe metrics into Kapost. These metrics are available on the Content, Analytics Dashboard Performance, and Custom Report pages. User Role Authentication: We request that you connect with a user role that has full access to all the emails/folders, that you would like to sync and have available in Kapost. Typically, an Admin level is good but if you prefer a user role that only has access to one folder that you will be working out of, you can connect that one as long as it has publishing rights. If you have any questions about the specific integration points please email support at kapost dot com. To connect your Eloqua instance to Kapost, Select App Center from settings on the side navigation bar. Select the button to install more apps. Then select the appropriate Eloqua button. A box will appear asking to you enter the appropriate authentication. Fill in your credentials and click 'Ok"
Go back to the settings menu, and this time click "Content Types and Workflows." Select your Eloqua content type. 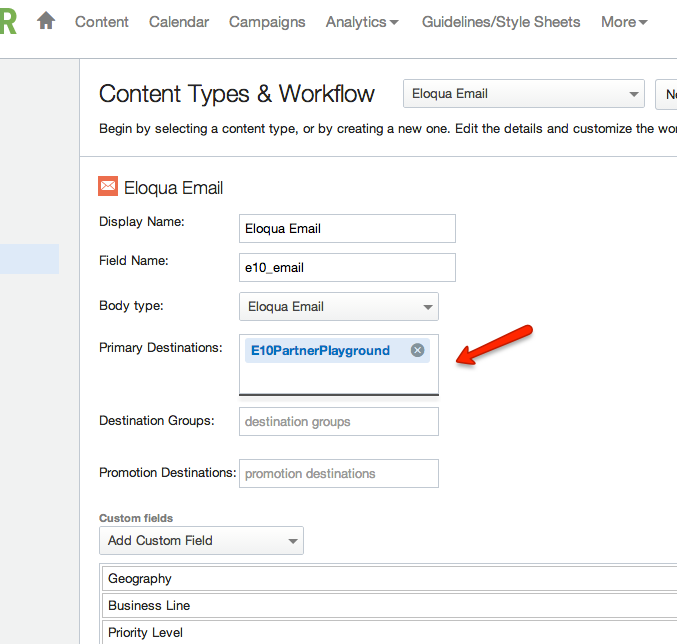 In the box next to "Primary Destinations," add your Eloqua instance.